There’s a lot of restaurants in NYC. 25,000+ to be close to exact. There’s Food on every freaking street in this town which is one of the reasons it’s so great. Endless, endless, endless options. Even at 599 Burgers logged in on this blog, I still haven’t eaten all of them, let alone even the most heralded or talked about ones. That doesn’t even take into account all the other types of Food & restaurants here. There is one trait that all the best have. It’s the reason why people go to eat there many times. It’s the reason why journalists write about them. 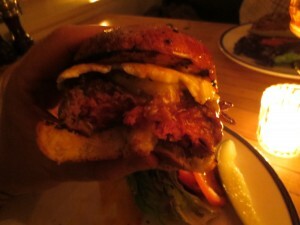 It’s the reason blogs like Burger Conquest take the time to point them out. It’s the same reason why everyone thinks their Mom or Grandmother is the best cook in the world. By default, Brad Farmerie is a Chef and restauranteur. He cooks, he creates recipes, he runs a popular restaurant called Saxon + Parole and he is part of the well known NYC based AvroKO Hospitality Group. Brad earned a “Grand Diplome” at Le Cordon Bleu, the the world’s largest hospitality education institution. He’s been on The Martha Stewart show, he’s published recipes, he was named a StarChefs “Rising Star Chef” in 2005 and so on and so on. The man has worked hard and earned his merit. Yes, you can all him all of these things and would be correct. But deep down at the base, Brad is really a lover. He doesn’t cook because he likes it. He doesn’t run a restaurant because it’s fun. He does these things because he loves them. He loves Food, he loves cooking and he loves hospitality. When you spend one evening dining at Saxon + Parole you will completely be surrounded and filled with his love. My buddy Mike owns a company called Edit Beach. They are a video production and editing facility based in NYC. Without ever having heard of them, there’s a good chance you’ve seen some of his work. If you were at the Food Film Festival in 2011 or came to a screening at my bar, Idle Hands, you’ve seen his work in “The Good Beer Seal.” This was a documentary made about the Craft Beer Bar scene in NYC and the Blue Point Brewery in Long Island, NY. 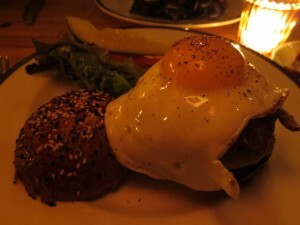 Mike wanted to catch up over some tasty eats and suggested we finally pop into Bard’s Saxon + Parole for a meal. We’ve eaten many of his dishes at The Food Film Festival but never actually into the restaurant. Mike and I intended on having a drink or two, a Burger and that was it. Nothing big or heavy but Brad & crew would have no such situation. The following is going to read as review of the meal but it could also be seen as an accounting from the time Brad and his staff tried to murder us with good Food. Before we get into that, let me explain one thing. The pictures in this accounting are going to appear to be dark and often blurry. I don’t agree with Anthony Bourdain that people should not be allowed to take pictures of their Food while dining. However, I would admit to thinking a flash constantly going off in a dimly lit restaurant could be pretty annoying to other diners. In those occasions, I choose to not use a flash out of respect to my fellow diners. 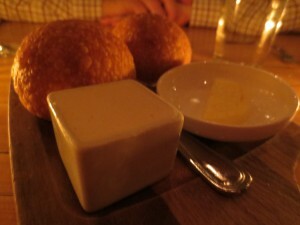 Sourdough Bread served with a Whiskey Miso Butter. This is one of Brad’s signature dishes. We passed on it because I wasn’t super hungry but also, I am a little weird about ‘Shrooms. It’s mostly a texture thing but none the less, I regularly choose to avoid. Thank God our server was not going to hear it. This dish is AMAZING. If you dine here and you do not get it, you did it wrong. The flavors are light and sweet and beaming with subtlety while the texture is very creamy. 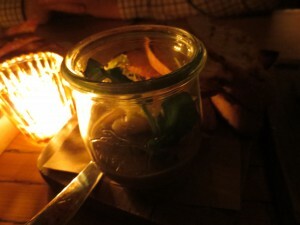 The Jelly is made with their signature Whiskey, Parole. Most dishes I eat at a restaurant I can figure out how to recreate at home. This one, not a chance. 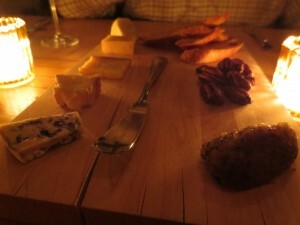 Saxon + Parole offers a constantly changing offering of local and natural Cheeses. To be honest, I didn’t have the wherewithal or time to write down which exact Cheeses we ate. What I can tell you that if you are a Cheese lover like myself, I can guarantee whatever selection they have on the night you dine there, they will be fresh, tasty and interesting. Be sure to try some of the spicy Whiskey Jelly too. You know what I would never think to order off a menu? 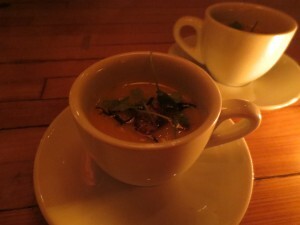 Apple & Rutabaga Soup with Roasted Chestnuts & Hijiki. It’s not that it doesn’t sound appealing, my eyes are just trained not to see that. Well never again! This dish was stupendous! The enchanting smell of it alone would have me walking through the door. In fact, someone call the Yankee Candle Company, this needs to be their next fragrance. It’s got a very strong presence so be sure to take the moment to get a huge whiff of the Soup. It’s yet another dish that is packed with all kind of subtlety. It’s very creamy, slightly Buttery & has a hint of sweetness. The crunchy Hazelnuts give it a nice texture and slight roasty flavor. 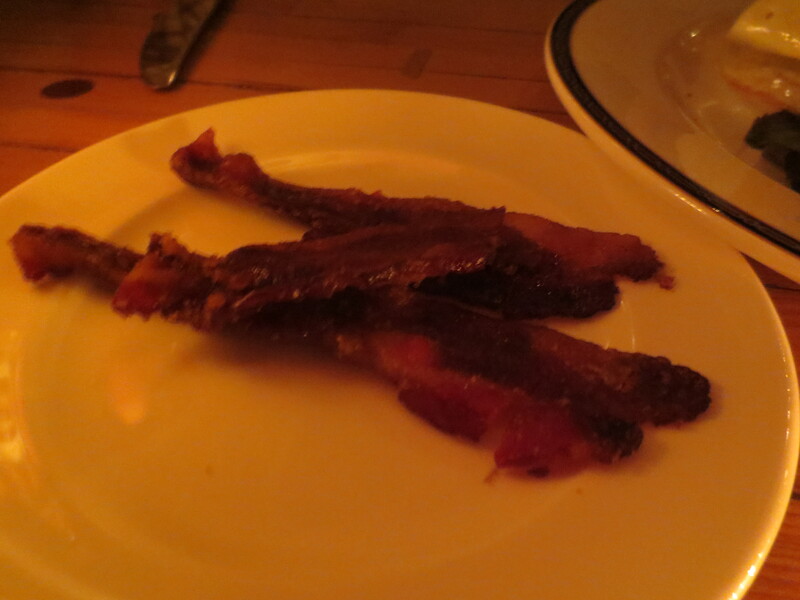 Bacon is like sweet and Peppery Candy. Not too chewy. Not too crispy. Definitely awesome. What’s my favorite item to put on a Burger? Easy, Cheese. What’s my 2nd fave? One might think caramelized Onions or Bacon but no, it’s a Fried Egg. There is something about the Yolk from an over medium Egg that for me, just takes the Umami moment of a Burger to a new level. 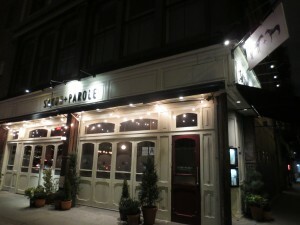 Whichever Egg’s they’re using at Saxon + Parole absolutely nail it. The taste, the texture, the sensation, the juiciness … this Egg is right on the money. I loved the dark Grain Bun. While most Burger Chefs would go with something a little more plain (IE White Bun) Brad packs a flavor punch with this one. The Patty is really Beef and has a hearty Steak taste to it. It’s rich, soft, a little Sweet and all wonderful. It literally tastes like a proper Steak. You’re gonna love this Burger. Brussels Sprout Leaves, Poached Egg, Toasted Hazelnuts, Crispy Pancetta, Truffle-Yuzu Hollandaise. At this point in the meal I was practically drunk on Food. We’re talking about fast approaching Food coma here. So much deliciousness coming at us in too little time. It was as if my taste buds had been on a roller coaster that every time it approaches the station, it goes for another ride instead of letting you off. Holy Flavor Bomb! These are sweet, spicy, Earthy, savory and smokey. If someone had told little kid me back in the day that Veggies could taste like this, well maybe I wouldn’t be writing a Burger blog. 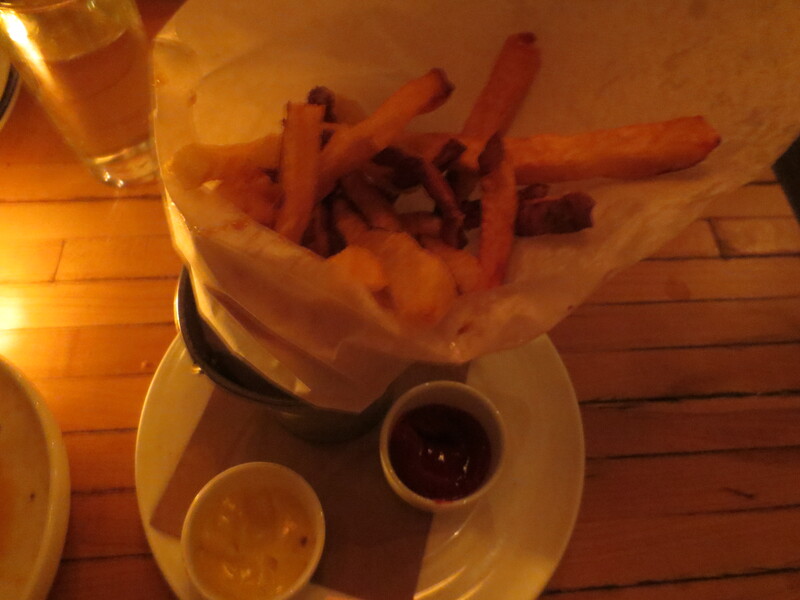 I was so full at this point that I barely touched the French Fries. They were definitely good, house cut, skin-on etc, but I was too full. The Sauces were great too but my palette and stomach could not handle another bite. We of course then retired to Madame Geneva, the speakeasy style cocktail bar behind the restaurant. Our gracious server walked us in through a hidden door at the back of the restaurant. Mike and I sipped on a nice Bourbon Sour before calling it a night. If the key to success in the restaurant business is great Food and even better service, than Brad Farmer is the key maker and Saxon + Parole is the Mayor’s Office. How anyone comes here and has a light meal is beyond my power of understanding. 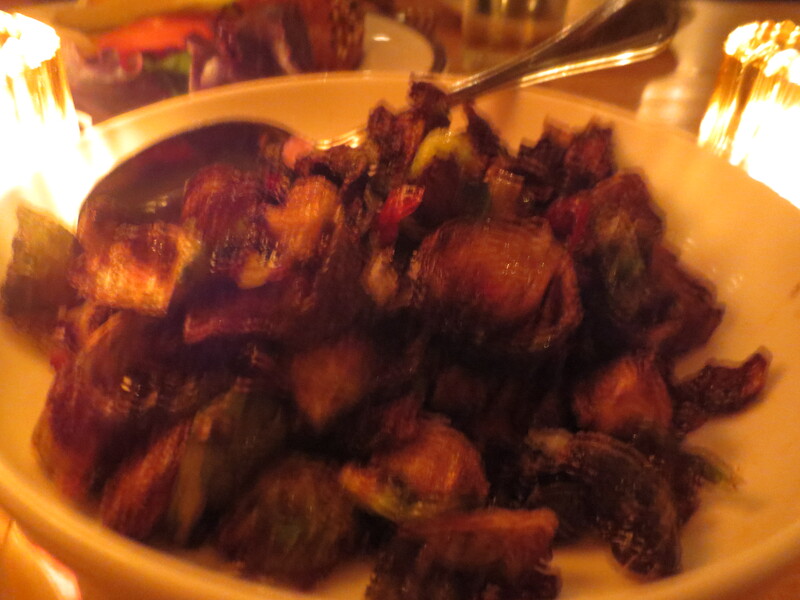 The Veggie dishes would cause even the strictest of carnivore to salivate. The attention to detail and making sure every moment, dish and employee in the places fits the theme is something only a lover could create. What an epic way to celebrate the 600th Burger of The Burger Conquest! This entry was posted in Bar, Burgers, East Village, Gourmet Burgers, Hamburgers, New York and tagged best burger, brad farmerie, burger conquest, cheese, ciancio, east village, edit beach, french fries, good beer seal, hamburger, madame geneva, mike fox, nyc, parole whiskey, rev, review, saxon and parole, the rev meter for social community. Bookmark the permalink.